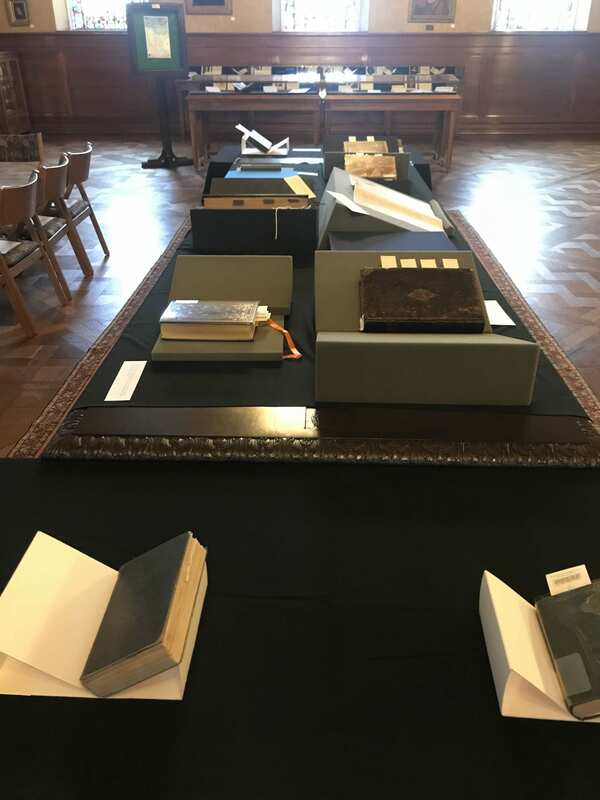 In Fall 2018, the Armstrong Browning Library (ABL) was privileged to either host or contribute materials to 16 instruction sessions. There was one class from each of the following departments: music, art, German, and a University 1000 course. The rest of our instruction sessions were evenly divided between English and history, with each department having 6 class visits. ABL’s Director, Jennifer Borderud, gives University 1000 students a tour of the ABL. 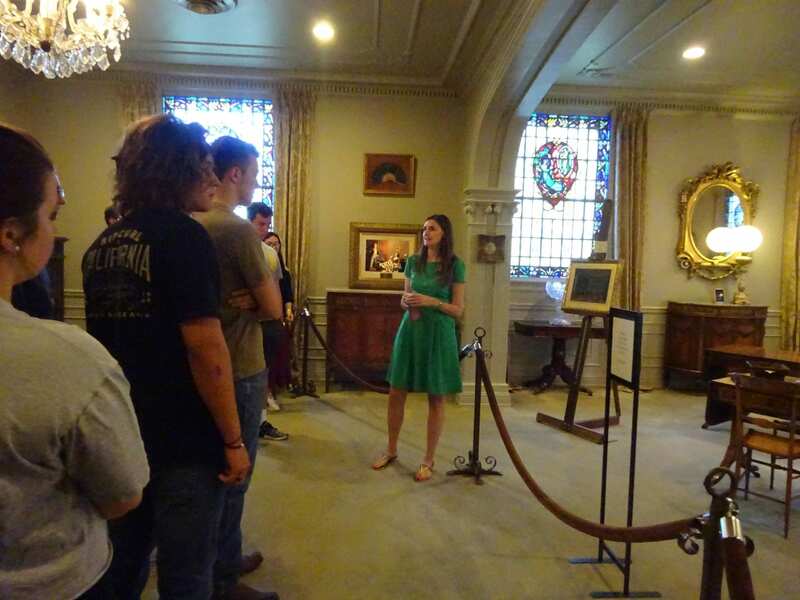 Two classes kicked off their semesters with tours of the ABL in August. Baylor’s Chamber Singers, who practice in the ABL’s McLean Foyer of Meditation twice a week, took a tour of the library to learn the history of the building and to view materials from the library’s Browning Music Collection. A University 1000 came for a tour as well, so they could learn why Baylor is home to one of the most beautiful academic libraries in the United States and discover some of the rich resources that can be found here. History 1307 students analyze primary sources. In September, our first section of English 2301: British Literature came twice. The first visit was to compare and contrast our collection of 18th-century editions of Shakespeare’s The Tempest and the second was to compare and contrast publications of Chaucer’s Canterbury Tales from 1600 to the present. The Central Libraries Special Collections collaborated with us and provided half of the Chaucer texts. Also, in September, we carried a selection of 19th-century abolitionist literature to Moody Library’s Active Learning Lab (Moody 104) for a History 1307: World History since 1500 class’s instruction session. The Texas Collection, the Baylor Libraries Book Arts Collection, and the Central Libraries Special Collections all contributed resources to an examination of written records of slavery in the United States. Our ABL Teaching Fellows, past and present, chose to bring their courses to the library during October. The month started with 2017 Teaching Fellow Paul Gutacker bringing his 8:00 a.m. History 2365: History of the U.S. to 1877 class to the library to analyze primary sources relating to 19th-century reform movements. Midway through the week, 2018 Teaching Fellow Joel Iliff brought his History 2365: History of the U.S. to 1877 class to analyze primary sources relevant to the themes he was covering. While the history classes overlapped in their topics and themes, each instructor selected very different sets of resources. 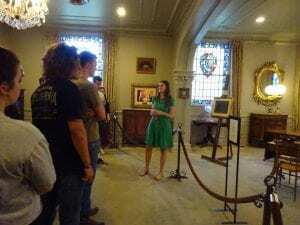 At the end of the month, our second Teaching Fellow for 2018, Dr. Ginger Hanchey, brought her three sections of English 2301: British Literature to the ABL for a tour of the building one day, and then brought them back a second day for the opportunity to survey items from the collections which corresponded to the main themes of her course. ABL resources waiting to be opened by students. In between the Teaching Fellows instruction sessions at the beginning and end of October, additional English faculty brought their courses to the ABL. 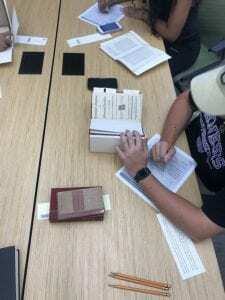 English 5304: Bibliography and Research Methods came to the ABL to learn how to find archival and rare book collections using digital resources and then to explore the variety of resources which are found in special collections. And another English 2301: British Literature class visited the ABL for a short tour of the building and rare materials display of manuscripts relating to the authors they were reading. November saw the return of 2017’s Teaching Fellow for one last session, and while we are happy to open the library early for instruction sessions (or stay late on occasion) those mornings do require an extra cup of caffeine. In the middle of the month, Art 3356: 19th-Century European Art came for a day to study 19th-century printed illustration styles and techniques. And our final instruction session of the semester involved escorting German 4320: Special Topics in German through the ABL as an exemplar of what constitutes beauty and how such determinations are made. We at the Armstrong Browning Library are always pleased when faculty members request to bring their classes to the building for tours or instruction sessions utilizing the collections. We are looking forward to returning classes and those coming for the very first time in Spring 2019. For more information about class visits, contact ABL Curator Laura French.